Best weight bench review. A workout bench is a foundation piece for a home gym. Add a few weights, and this one piece of equipment allows you to get a full workout. Options are for a flat, incline or decline bench. With so many benches on the market, it can be challenging to decide which one is right for you. Here are 10 options to consider. This bench combines practicality and performance. Designed to offer versatile workout options and sturdy enough to handle intense training, it could be a great addition to a home gym. As a bonus, its slim design means it won’t take up much space and will fit perfectly in small rooms or spaces. Among flat benches, Rep stands out for its power. With its thousand pound rating, it handles several hundred pounds more than some competitors. The bench works well for anyone using dumbbells and other free weights. 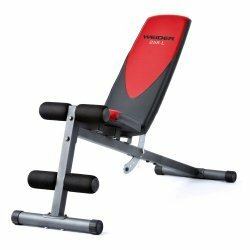 Get fit at home using the versatile Weider Pro 255 L Slant Board/Ab Bench. The bench has a 90 degree seat adjustment that folds to one upright, one flat, one decline and three inclined positions. A sewn vinyl seat offers soft cushioning while exercising. Why pay pricey gym fees when the Fitness Reality 1000 gives you the power to exercise at home? The bench has tubular steel frame construction. With an 800 pound capacity, you choose how intense to make your strength training. Multiple adjustments allow you to pick your best position for exercising. If you want to target more muscle groups, you need a bench that lets you change its incline settings, like the CAP Barbell Deluxe Utility Weight Bench. Your options are seven back support positions and three seat positions. All steel construction shows how sturdy the product is and why it could last a long time. With a 500 pound capacity, there’s no need to hold back on the amount of weight you lift or the amount of bodyfat you want to lose. Bowflex, known for its home gyms, offers the SelectTech 3.1 Adjustable Bench for those who want to maximize workouts and build more muscle without having to leave home to get results. With more muscle, fat burning is easier and your metabolic rate goes up. Designed to use space efficiently, the bench will fit seamlessly into a house, ready to feel the burn whenever you are. Part of its appeal is that it combines all the strength training of various equipment found at a gym, including using smooth, consistent resistance while going through a range of motion. This helps build lean, strong muscle. Marcy makes exercise a priority, and with their adjustable bench for full body workout, you may find it easy to do the same. This all-in-one unit lets you work arms, legs, thighs, chest and core or deal with whatever bodyweight issue you choose. Its ergonomic design helps the user get the most out of their exercise experience, and a padded seat keeps weight evenly distributed for more comfort. With foam padded knee and ankle rollers, users can target glutes, quads and hamstrings. Exercising at home is convenient when you have a bench that gives you a full body workout. 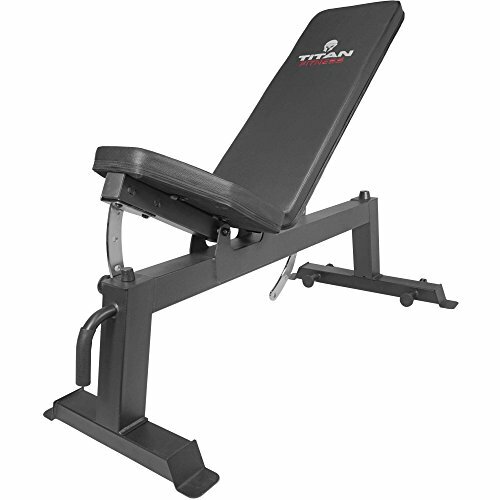 Titan’s adjustable flat incline bench is strong enough to handle your intense workouts and has a 650 pound capacity. It has a rigid steel base and bolt holes if the owner wants the bench permanently mounted. At just under 20 inches, the bench height is ideal for bench pressing. 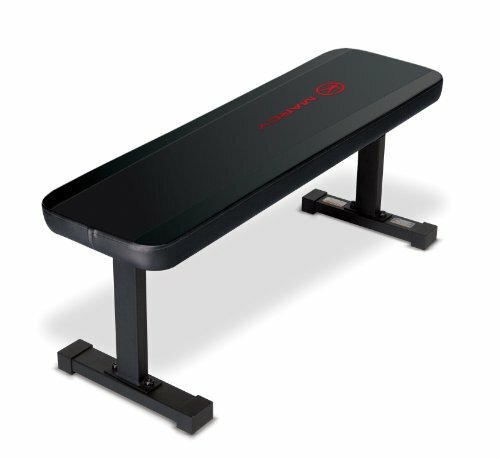 The Adidias Performance Flat Training Bench has a compact design. While it may look like a no-frills piece of equipment, this bench offers users an excellent home gym with a weight capacity of 600 pounds. In testing, the bench held 1,000 pounds. Durably constructed with a powder coated finish and steel tubing, it works as easily for helping to lose bodyweight. Designed with beginning exercise enthusiasts in mind, the Body Champ bench could work well for seasoned users as well. In one compact unit, you get tools to help build strength, including a multi-position bench and leg developer. Using the foam-roller-aided leg lifts, you can work your lower body, upper body and core. Keeping newbies in mind, the weight capacity is held to just 250 pounds for both the user and the weights. While that number is on the low side, it’s a great way to ease new users into weight training, and it’s an opportunity to get back into weight training for anyone who has gotten lax in exercising. The bottom line for anyone considering buying a weightlifting bench is exercise. If it’s too difficult to get to the gym, you don’t like going to gyms or you the speed of having exercise options ready when you are, a bench might be the better option for you. Instead of letting weightlifting fall through the cracks, consider the pros and cons of using a bench at home. 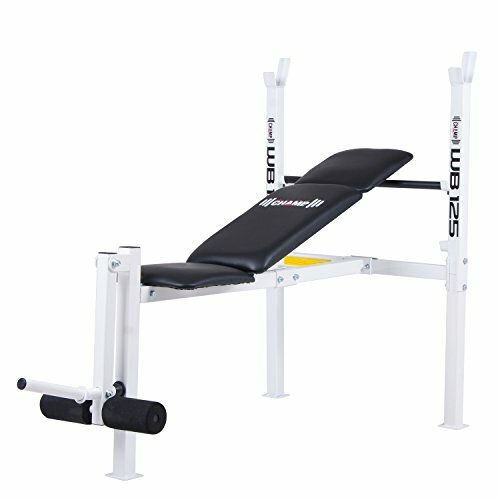 Marcy Flat Utility Weight Bench for Weight Training and Abs Exercises SB-315 High density foam protects your back during workouts and keeps you comfortable. Made of heavy-duty steel, the frame keeps the bench steady while in use. Its powder-coated finish helps resist wear and tear from regular use, which means it should last a long time. The bench has a 300 pound weight capacity. The bench does not incline or decline. Some may find the compact design too small for certain body types or taller users. 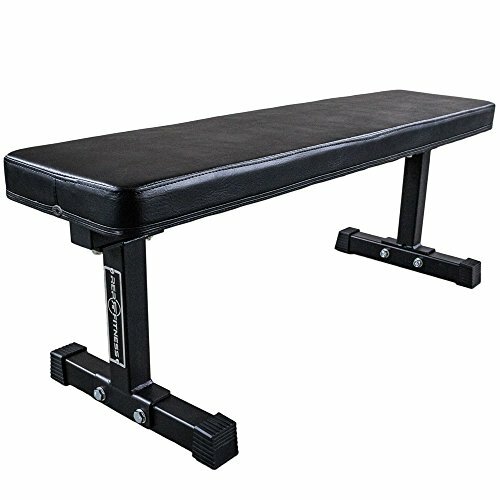 Rep Flat Bench FB 3000 Has a thick steel, heavy-duty frame that gives it stability and durability, and users won't find the bench moving during their exercises. Rated for up to 1,000 pounds, users don't have to worry about the bench caving under pressure of heavy weights. Work out in comfort thanks to a dense foam core and a softer top layer that are two-and-a-half inches thick. The bench is flat, so there is no option to adjust it for inclining or declining. Assembly may be challenging for some, and others may have trouble getting the bench properly leveled. Weider Pro 255 L Slant Board/Ab Bench Can adjust the bars and seat to use in multiple positions, which makes it easy to customize workouts to your specific needs. Steel constructions means it could last a long time, and a four-roll leg lockdown means more control during workouts. Another featured is the arm press for targeting muscles in the arm and chest areas. Includes an exercise guide created by a certified personal trainer to help get your workouts started right. Some users report stability issues and concerns that the bench size is not suitable for taller users. 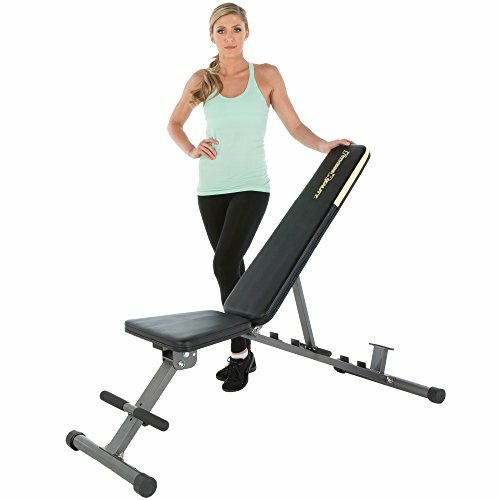 Fitness Reality 1000 Super Max Weight Bench Two adjustable leg positions in front give you 12 backrest angles. Bench has options for flat, incline and decline positions. Extended leg stabilizers keep you from moving or rocking while lifting weights. The bench has transportation wheels so you easily can move it from one room to another, and when not needed, the bench folds up for easy storage. Bench may not be a comfortable fit for taller users. There may not be enough seat padding to make it comfortable for every user. 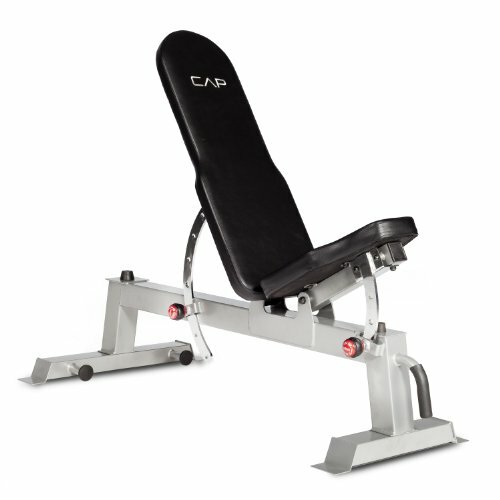 CAP Barbell Deluxe Utility Weight Bench The CAP bench has multiple adjustment settings and a high weight capacity. Transport wheels and handles make it easy to move. There is more padding in the seat and back cushions for extra support. Adjustments are easy because there is no locking mechanism or sliding carriage to possibly get stuck in place. Base stabilizers are wide and close to the ground to add stability. There is a small gap between the seat and back support. The locking mechanism may not stay in place, which could lead to falls. 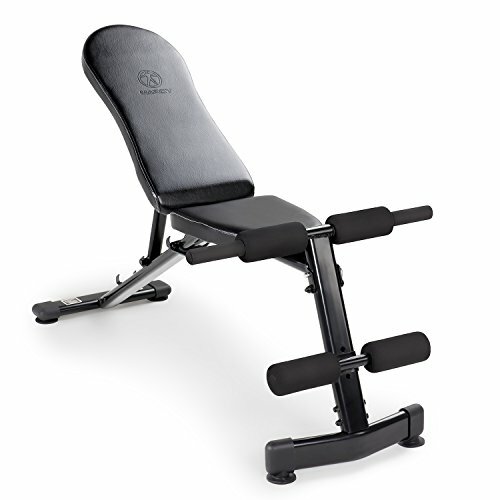 Bowflex SelectTech 3.1 Adjustable Bench Adjusts to four positions. Over 30 exercise options. Promotes safe workouts by correcting posture and stabilizing the user's position. For added support, the bench has a removable hold-down leg brace. Supports up to 300 pounds for a user's weight and another 180 pounds in free weights. Does not fold to be stored away. Some users say the parts don't line up properly during assembly. Holds up to 300 pounds. Premium padding means excellent back and body support, comfort while sitting on the bench and while reclining. Includes an adjustable back pad that lets the user change between four abdominal positions. Compact in design, the bench can be folded and stored. Taller users may find the bench to be shorter than they would like. Some complaints were made that bolts don't fully tighten and parts don't align properly. Back and seat are adjustable. Both are padded to make working out more comfortable. Assembly is typically quick. Leather finish. Some don't believe the padding is thick enough to be comfortable. Others believe the product is not as sturdy as possible. 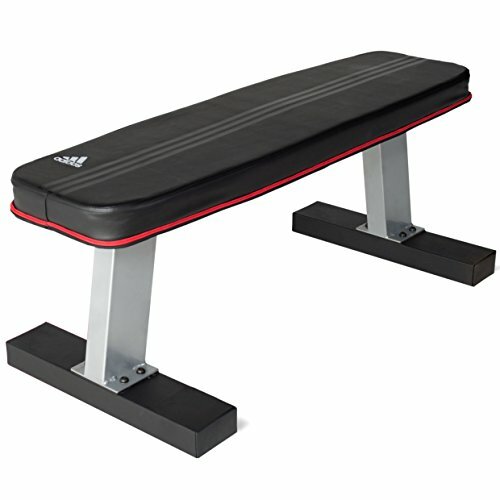 Adidas Performance Flat Training Bench Sturdy construction. Boxed upholstery adds durability. Thick, high-density foam padding adds comfort. At just 28 pounds, it's easy to move from one location in the home to another. Easy assembly. Assembly may require more than one person, and some claim instructions are not as clear as possible. The bench is not adjustable. Workout in one flat and two incline positions. The uprights are sturdy and compatible with most all barbell sets. It has a leg lift attachment built it, and seat and back have three piece padded cushions. Great bench for beginners. It's also good for anyone who used to work out and is looking for a way to ease themselves back into it. Lower weight limit of 250 pounds makes the bench more suited for beginners. Its compact size may make it unsuitable for larger users. Convenience is one of the best reasons to workout at home. Everything is right there, and you can start weightlifting whenever you want. It’s also private. Home gyms save you time because you don’t have that commute to and from the gym, and you won’t ever have to wait to use a piece of equipment. You’ll also save money. Even with the higher initial cost to set up a home gym, you won’t have to pay a gym fee monthly. Using a bench can speed up fat burning because muscle burns more calories than fat. It’s likely that it won’t take long to start seeing changes in body fat, which occur when the metabolic rate increases. There are some drawbacks to having a weightlifting bench at home. A less expensive bench will still require more upfront cash than a gym fee. Another issue is not using the bench because of distractions, such as kids, phone calls and other things happening at home. Working out at homes also requires self-motivation and discipline, which some people may lack. Before buying a bench, think about safety first. The bench should be stable so there’s no unnecessary movement, which means it needs strong, sturdy frame. Second, the bench should have enough padding to be comfortable for you while in use. That means your back should not hurt because of the bench while you exercise. Next, ask yourself a few questions. Do want a flat surface of an adjustable one? 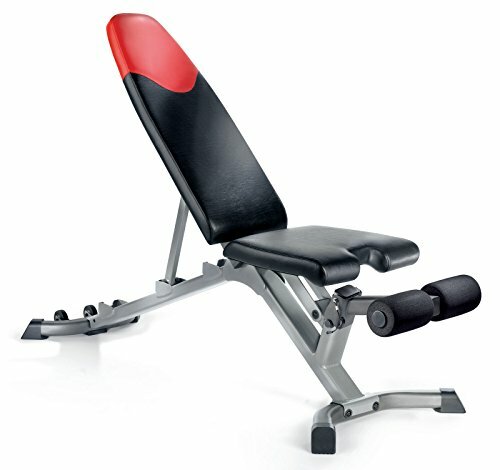 How much of an incline or decline bench do you want, if any? The adjustability of the bench gives you more exercise options. Also consider how easy it is to adjust the bench. What size bench will best fit your body and has enough room for you to rest your head? How long do you hope the bench will last? Well-constructed benches last longer, but they may cost more. If you go for high-quality, look for a bench that supports heavier weights. Also consider what attachments, if any, the bench includes or can support.